Less noise. More power! 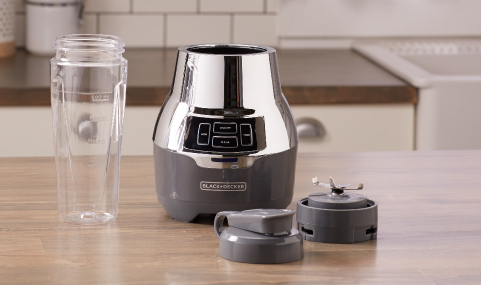 * The BLACK+DECKER™ PowerCrush Digital Blender with Quiet Technology is designed for maximum convenience. The PowerCrush Blade Technology creates a powerful vortex to efficiently blend all types of ingredients, and the 700W motor easily crushes ice and frozen fruits. 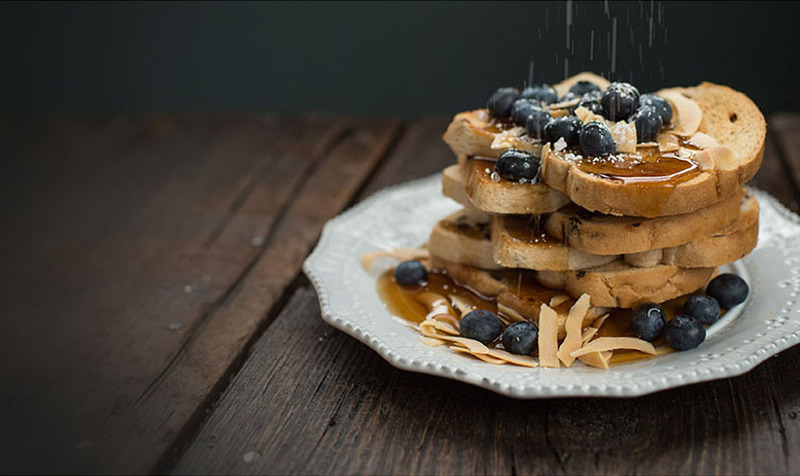 You’ll love the 18oz. personal jar made of strong Tritan® plastic. 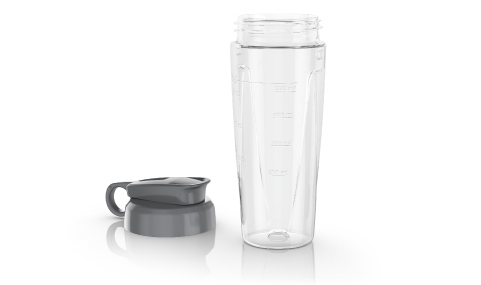 It’s perfect for taking protein shakes and other blended drinks on the go. Cleanup is easy, too, with dishwasher-safe removable parts and a sealed control panel that wipes clean in no time. See the difference less noise can make with the QuietCrush Technology inside the BLACK+DECKER™ PowerCrush Personal Quiet Blender. *Compared to BLACK+DECKER™ PB1002 – less noise based on (1) High Speed assessing decibel value and loudness value at standard voltage; (2) more power based on 700 watts peak power. Blend without interrupting your life. 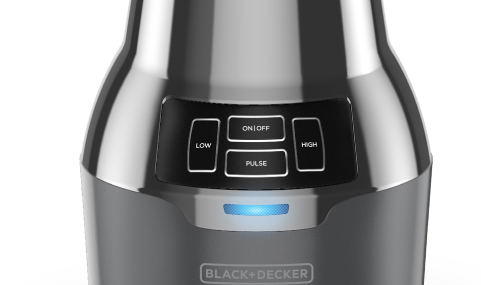 This PowerCrush Blender is quieter*, and maintains all the powerful blending performance you expect from BLACK+DECKER™. The 4-tip stainless steel blending blade works with the shape of the jar to create a constant flow and vortex that leads ingredients directly to the blades for fast blending performance. The intuitive controls are easy to clean and light indicators for easy operation. From smooth blending to powerful ice crushing, two speeds and a pulse function handle any job with ease. Includes LED power indicator. Cleanup is a breeze with the dishwasher-safe jar, blade, and lid. Use the 18oz. BPA-free Tritan® plastic jar for single-serving smoothies on the go. Snap-on travel lid included. PowerCrush Digital Personal Quiet Blender is rated 3.5 out of 5 by 93. Rated 1 out of 5 by BBee from A Good Blender Ruined by Terrible Leaks! I was so excited about this blender and couldn't wait to use it. It worked flawlessly at first but after a few uses began to leak everywhere and made huge messes all over my counter with each use. I don't know if I have a faulty blender or what, but it seems to be a common problem with this blender. Rated 2 out of 5 by Aimpa8 from Great, at first. I loved my new blender right away and it worked great for a few weeks. Then, it started to leak when I would attach the blunder cup with the blade. I can't blend anythign without it leaking. I'm guessing the rubber seal in the blade attachment has moved so now it will leak. I tried so many times to adjust the rubber seal and I can't figure it out. I wish it didn't leak. Rated 1 out of 5 by Hoosier from Take this blender OFF the market I have owned many B&D products over the years, to great satisfaction. And now wish I had read the reviews on this before purchasing. I have had mine for less then two months and like almost all other reviews, the lid leaks!!! And makes a huge mess. I make smoothies in the AM when I have to attend an early business meeting, which is often. I was thrilled at first, and then all of a sudden....it leaks! I thought perhaps I had lost a rubber washer and went to this web site to explore. And see there was no washer, and the sad number of other unhappy folks with this same problem. How will you resolve this? I would love to give more than one star, but I cannot. I did not keep my receipt because I was confident there would not be a problem. And it is outside the 30 day return in any event. Rated 5 out of 5 by Uniquemami from Small, but powerful! The PowerCrush Personal Blender is a great blender, not only for the price but for its portable size. We don't often need access to huge blenders in this family, and this is where the PowerCrush steps in. It is quieter than most other blenders of similar build in the market, although, you have to expect some amount of noise level whilst using it. I find it great for making our daily smoothies as it has no issues breaking down the ice and frozen fruit. Although it is capable of handling much more. I would even use it to create personal servings of soup or spaghetti sauce.It includes a single server jar as well as a travel lid which has a pouring lid that is easy to drink out of without worrying about any spills.For a personal blender, you will not get much better than this one, I fully recommend it for those looking for a blender that will provide them with quick shakes and smoothies with limited noise and ease of use. Do the cushion blade two pack containers work with this product?